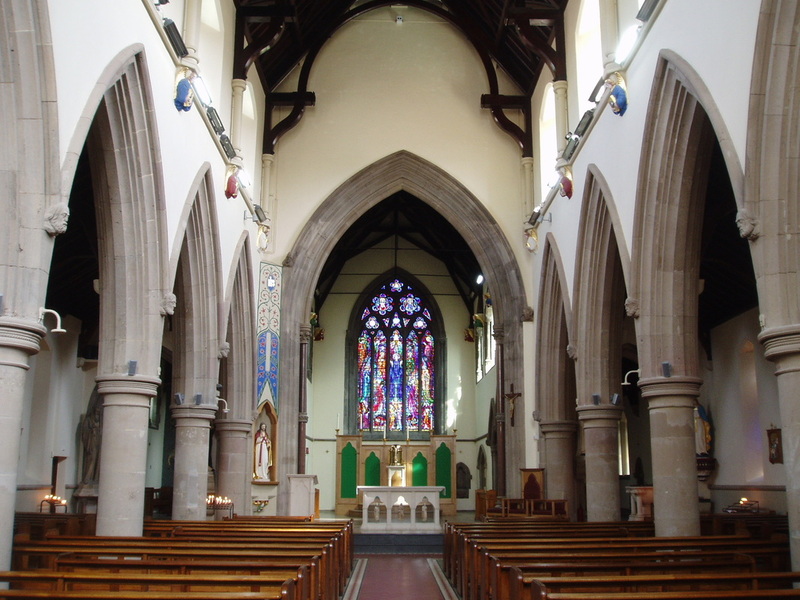 Coventry's principal Catholic church was isolated from the centre of the city by construction of the inner ring road, and seems to gaze yearningly across it towards the busier heart to which it once belonged, if only on it's fringe. 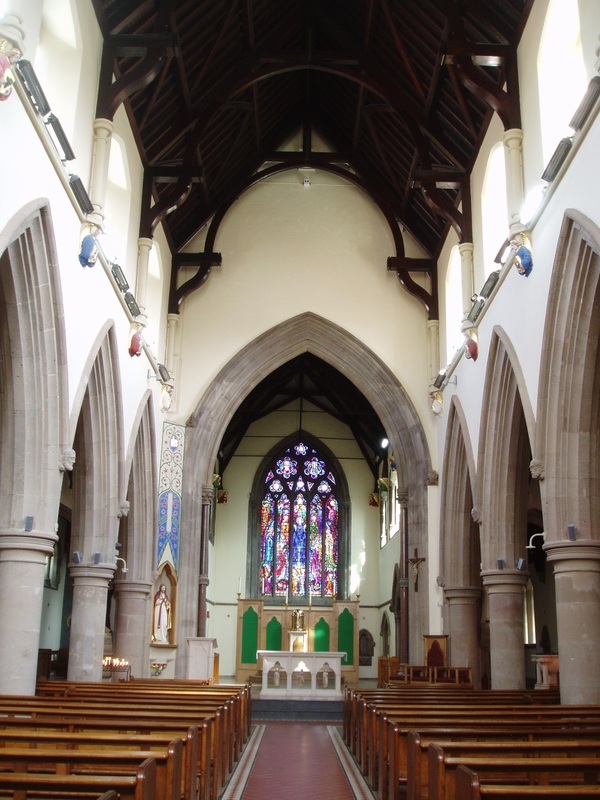 As a result it is largely unknown ignored by visitors to Coventry, and to my shame despite knowing the city very well over the years have only just made my first visit to the church, having been made aware of it by some friends who worked on it's recent restoration. 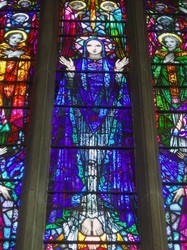 It was a revelation, for this is a beautiful church with some truly gorgeous glass. 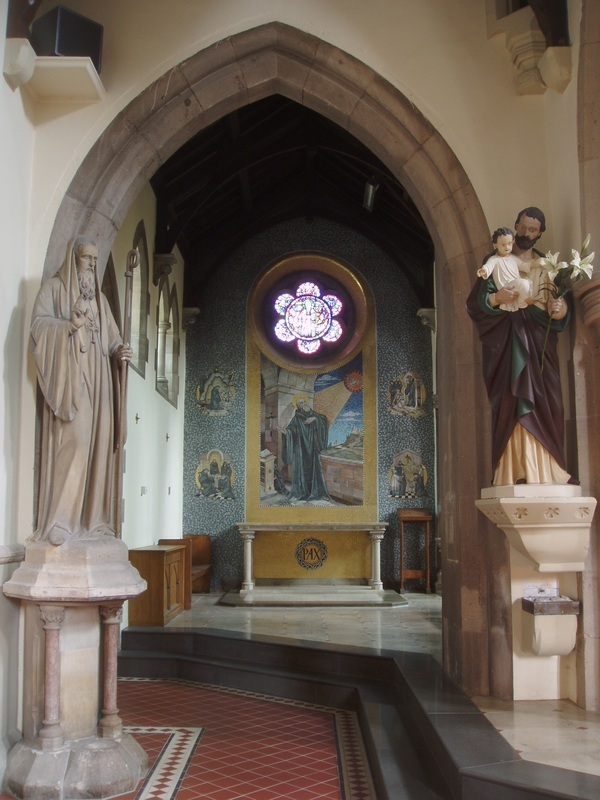 The church is appropriately dedicated to Coventry's local saint, St Osburga, who founded a nunnery, the first settlement in the city and was buried here in 1018. 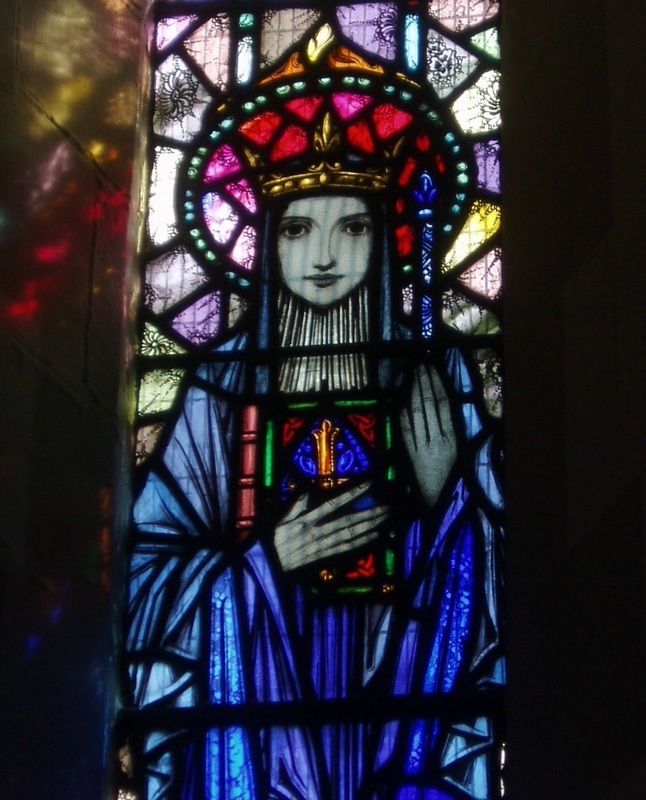 Refounded by Leofric and Godiva in 1043 after it's destruction by the Vikings, Osburga's monastery grew into the city's first Cathedral of St Mary, and her shrine was venerated and became a place of pilgimage throughout the Middle Ages. 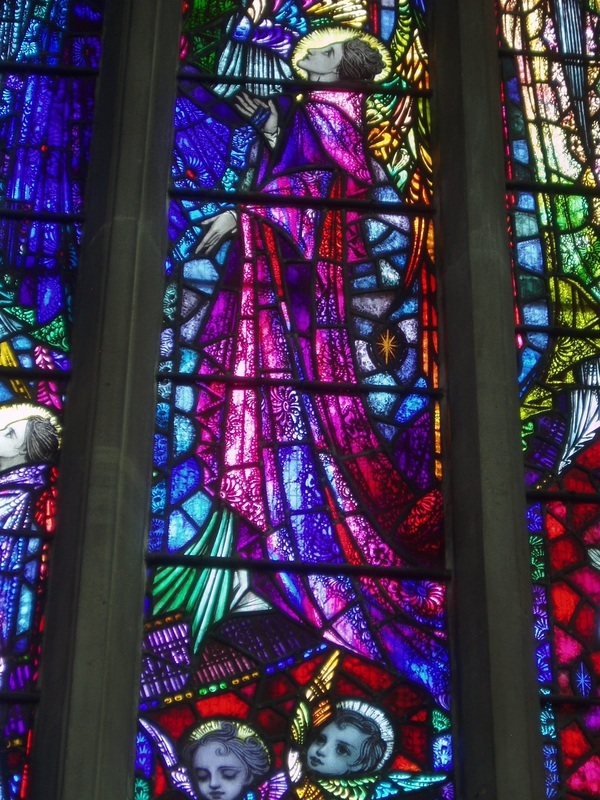 The tragic loss of Coventry's first cathedral at the Dissolution has left her grave with no marker, and we can only speculate as to where exactly she might have been laid to rest. 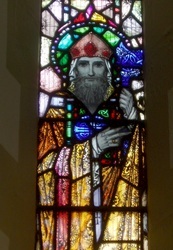 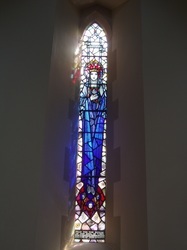 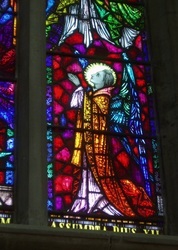 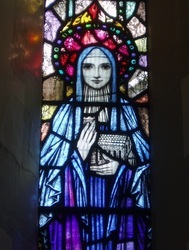 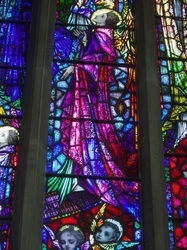 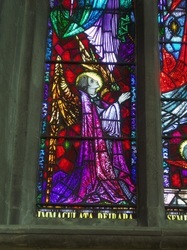 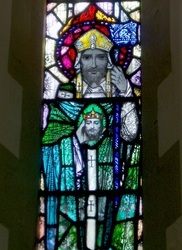 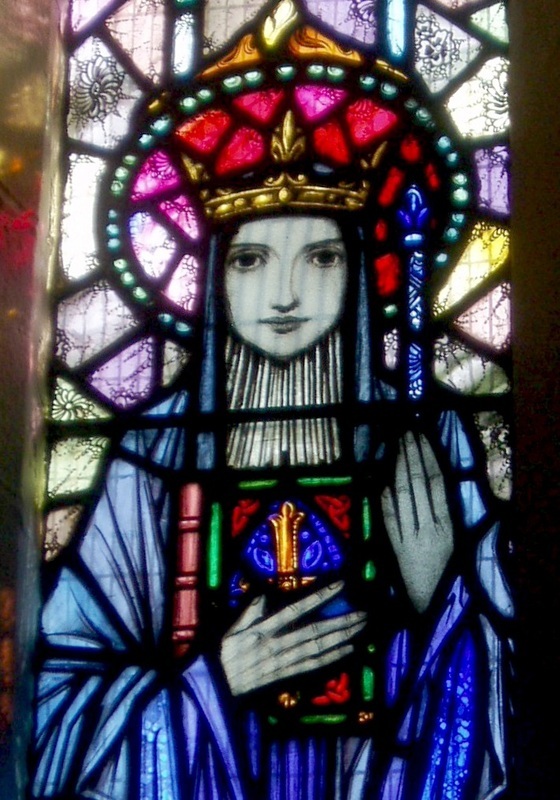 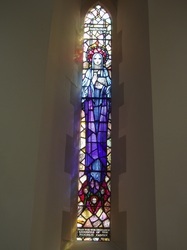 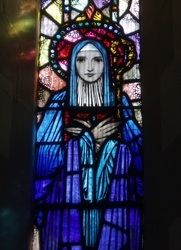 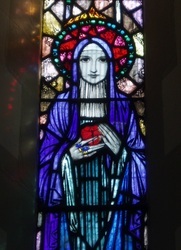 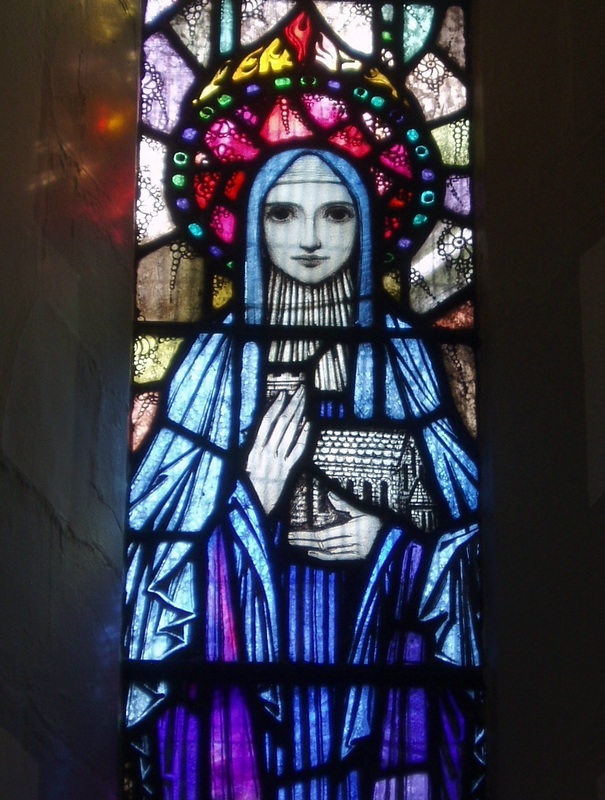 In an act of continuity her image is included amongst other Midland saints towards the bottom of John Hutton's engraved glass screen in the present Cathedral. 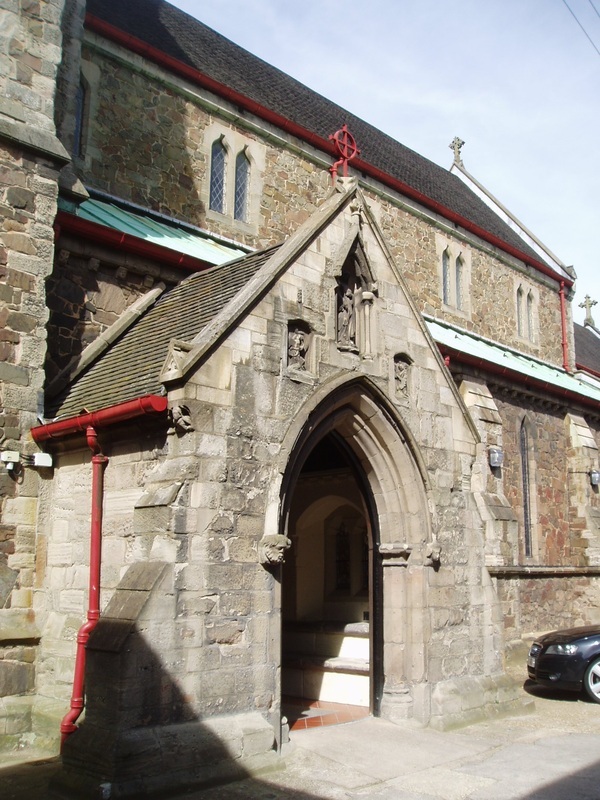 St Osburg's was built in 1843-5 to the designs of Charles Hansom, one of his many Catholic church commissions found across the country. 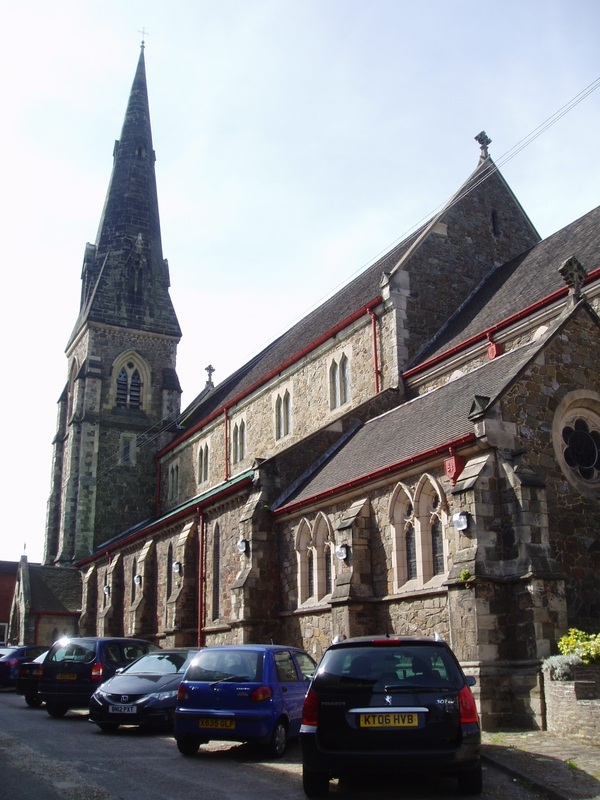 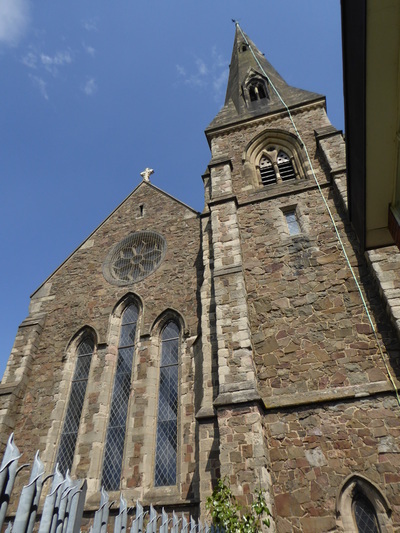 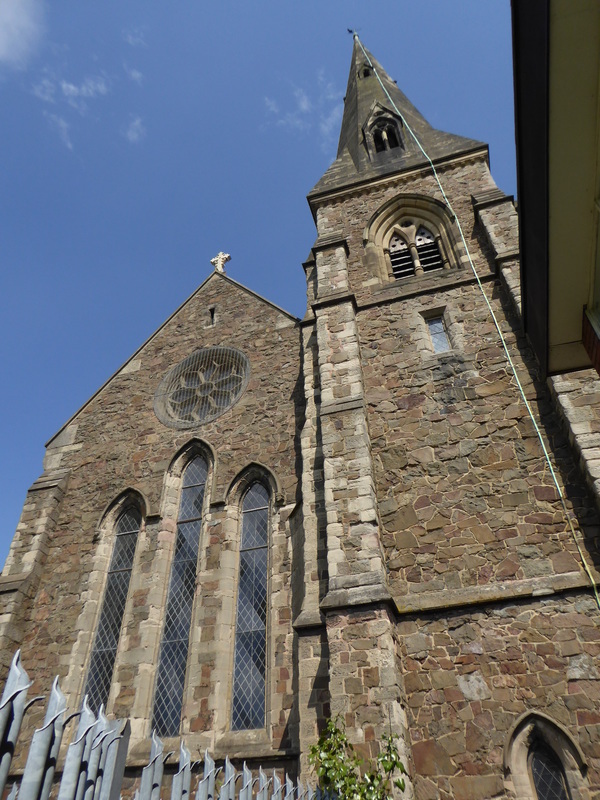 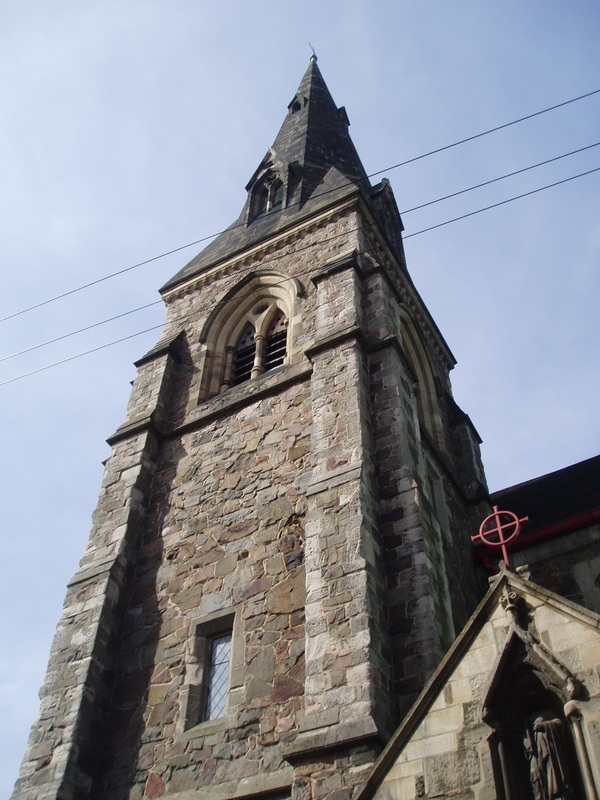 As a design the building is fairly ordinary, run of the mill Victorian Gothic, with a southwest tower crowned by a tall broach spire which makes the church a landmark in this otherwise mainly residential area of the city. 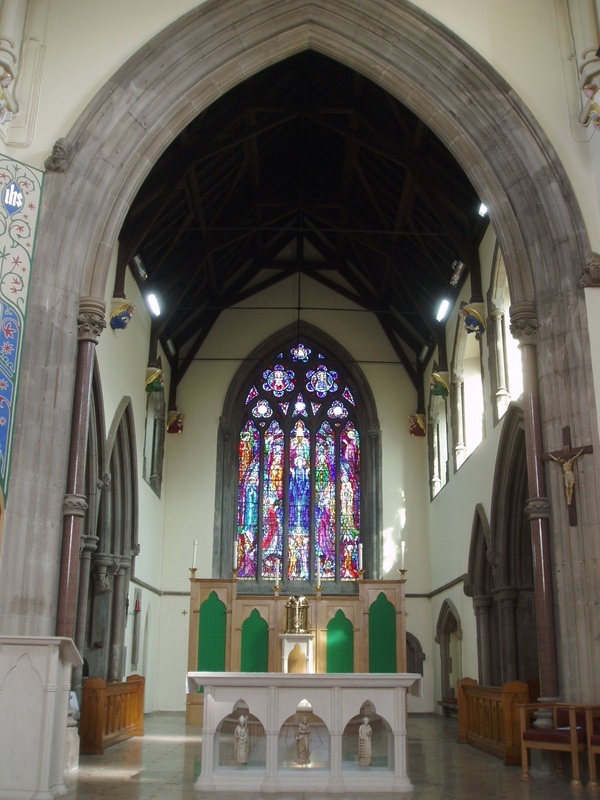 No doubt the furnishings and glass were much the same as those of numerous other Victorian Catholic churches in this country, though history had other ideas here. 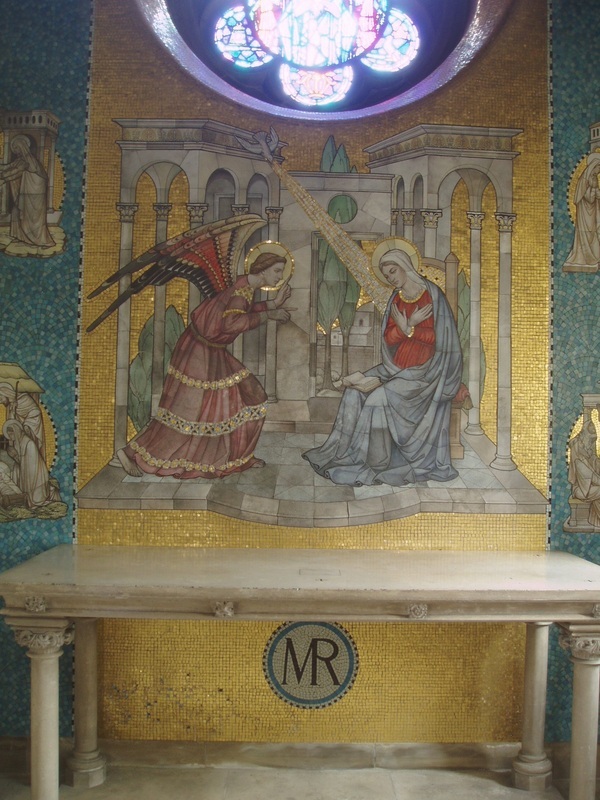 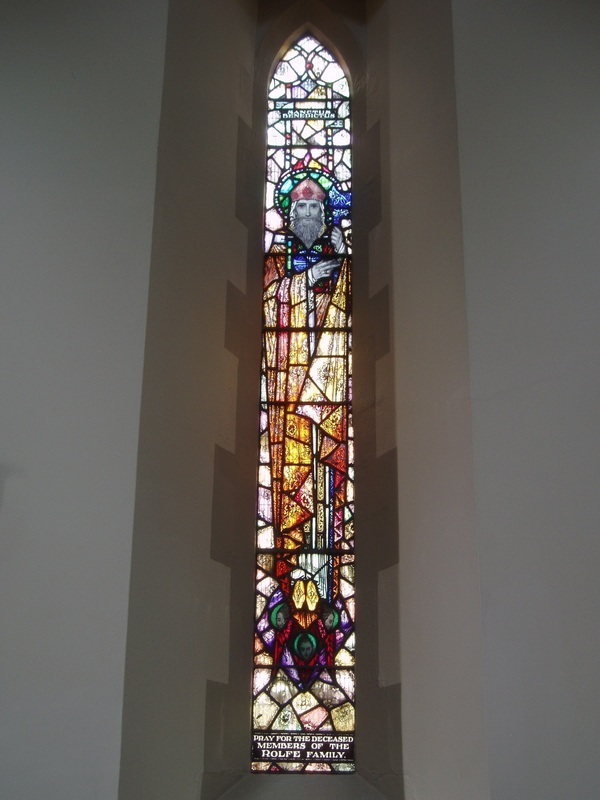 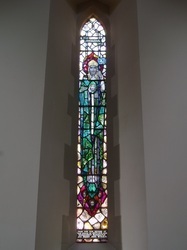 The church's postwar restoration enhanced the building considerably by adding some magnificent new artworks. 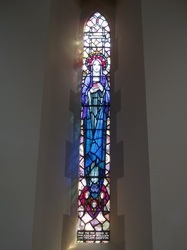 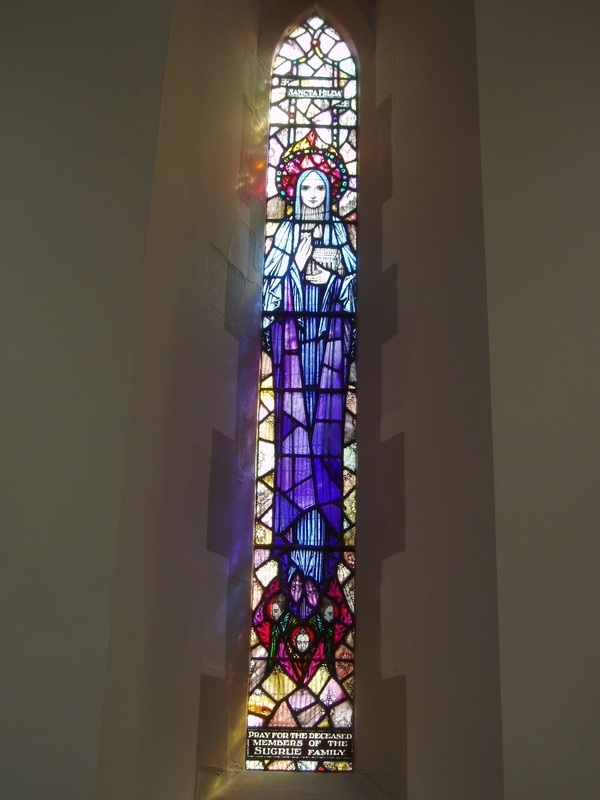 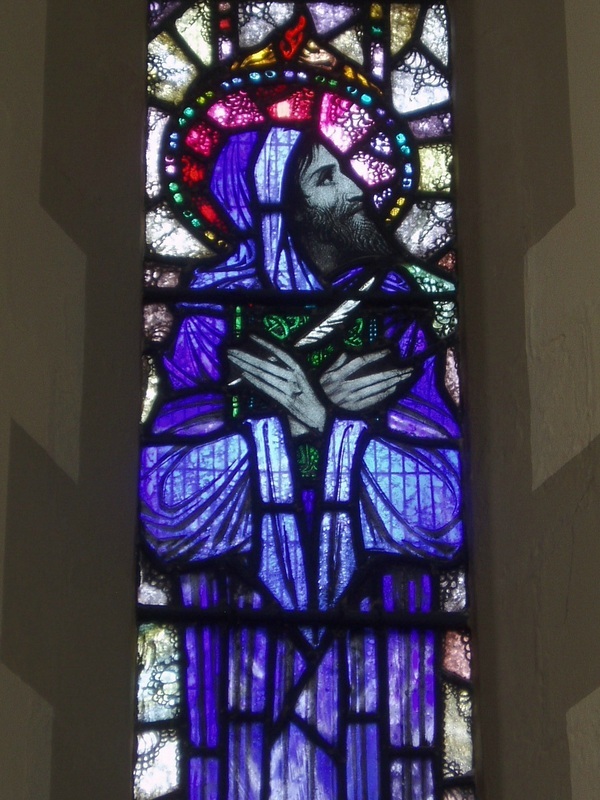 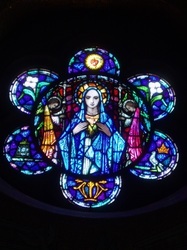 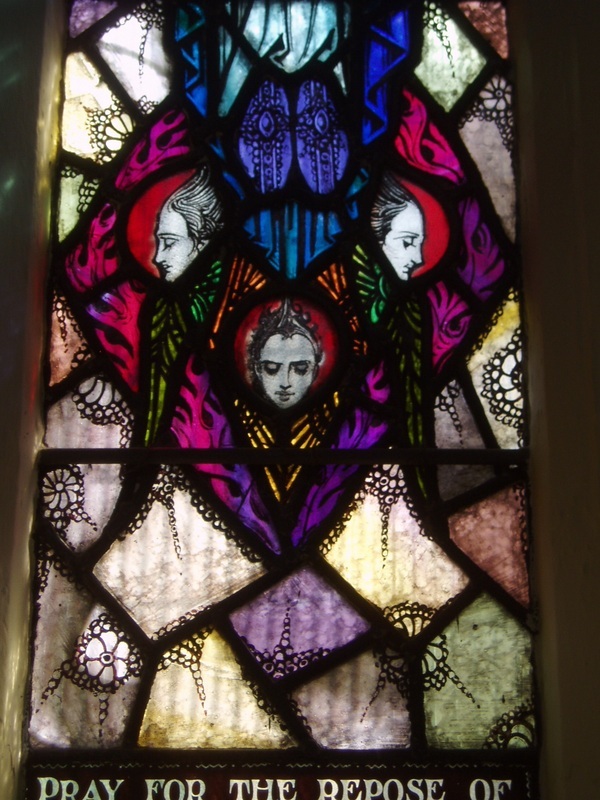 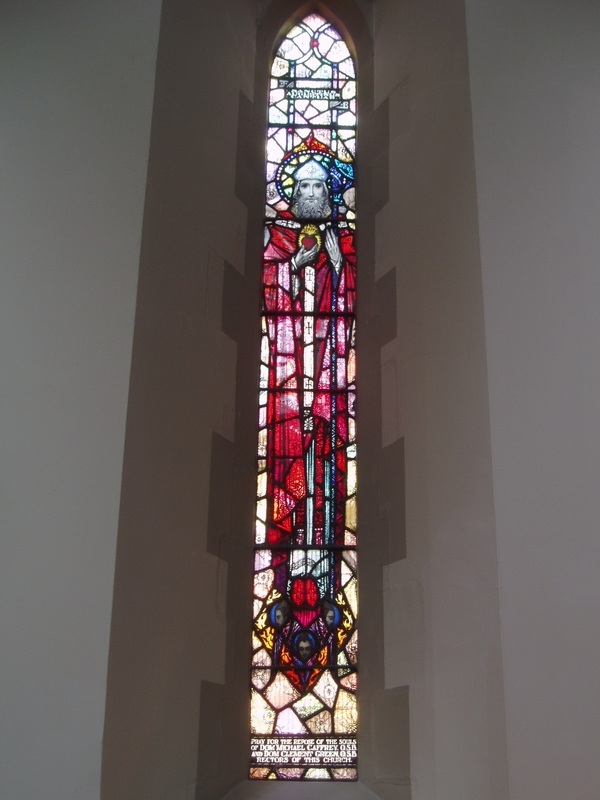 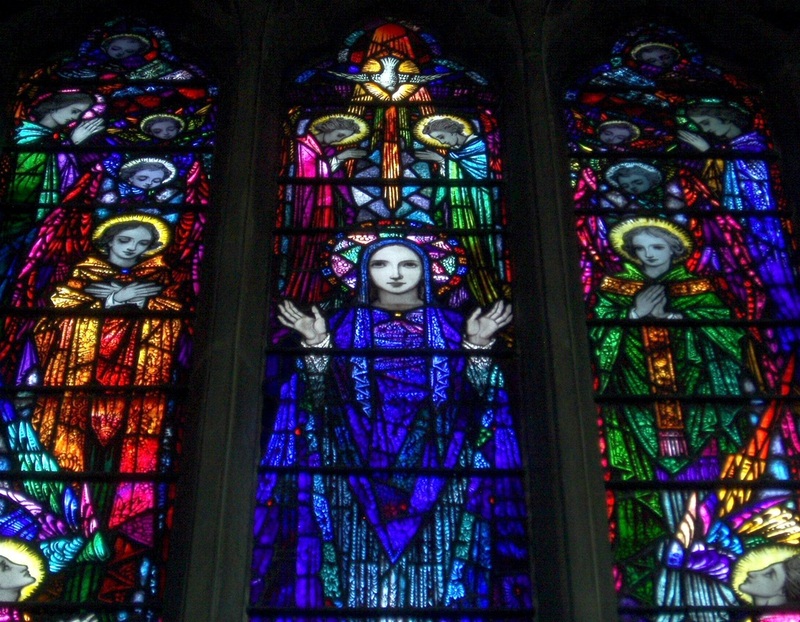 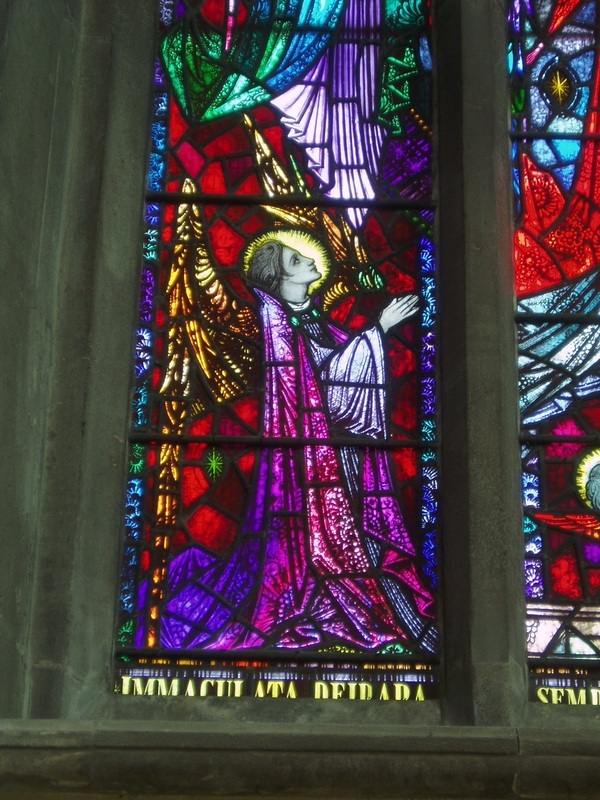 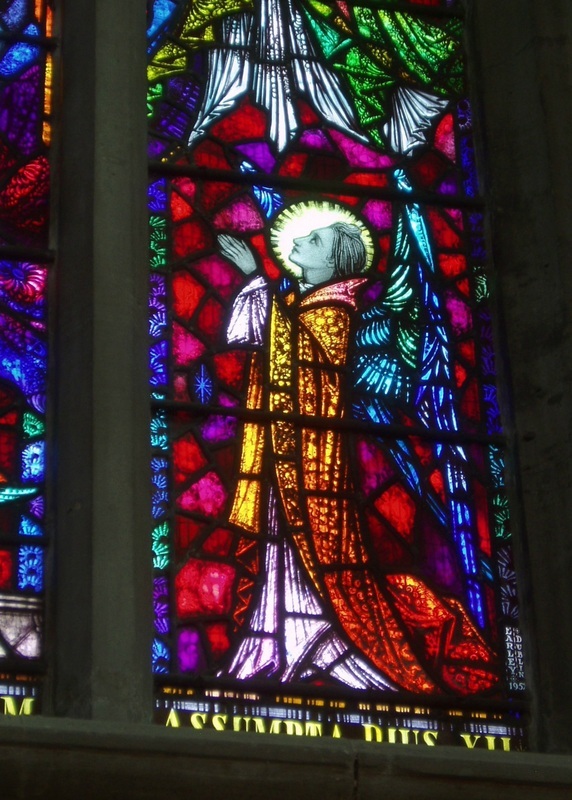 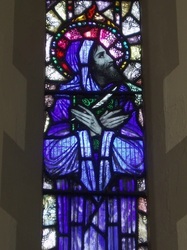 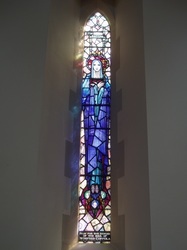 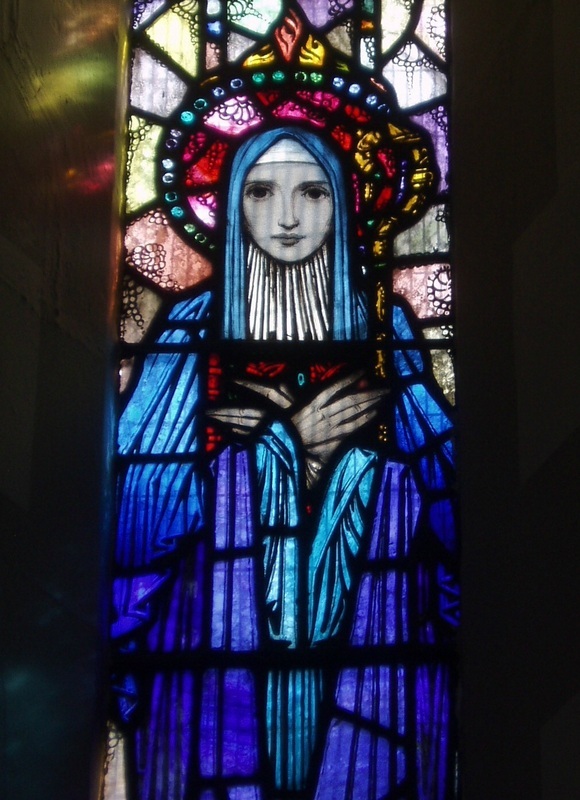 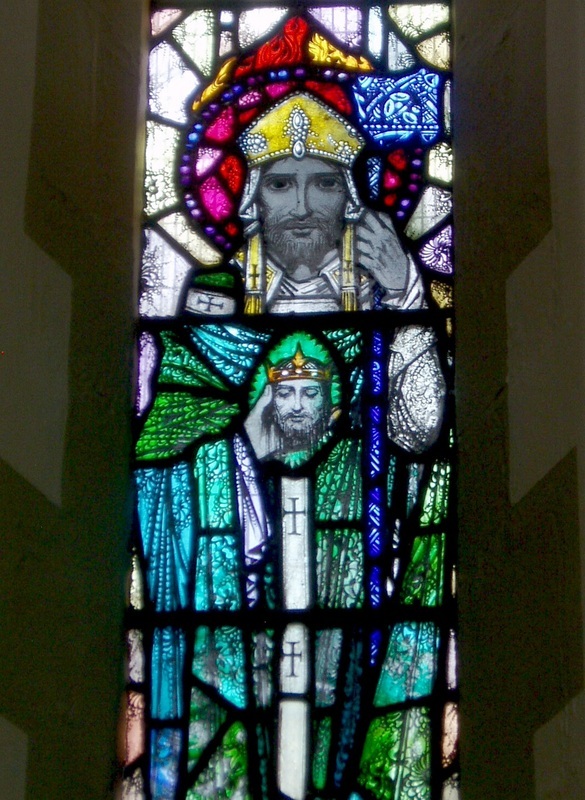 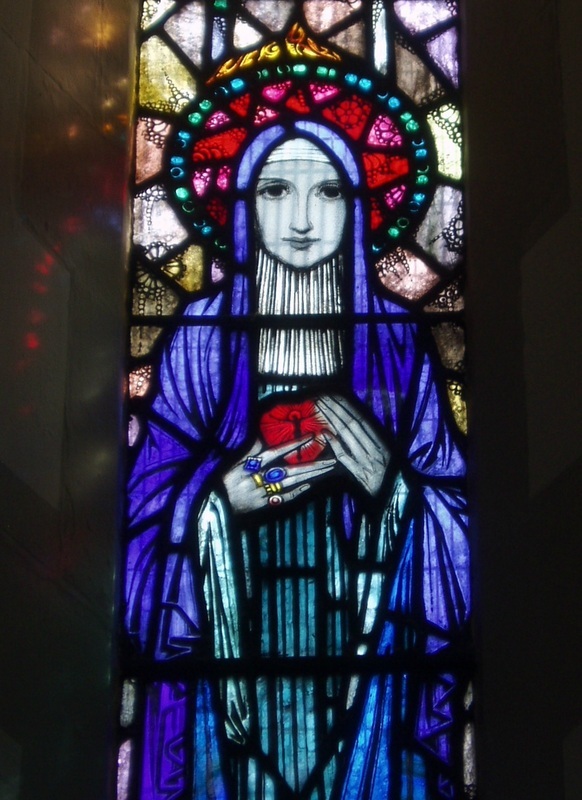 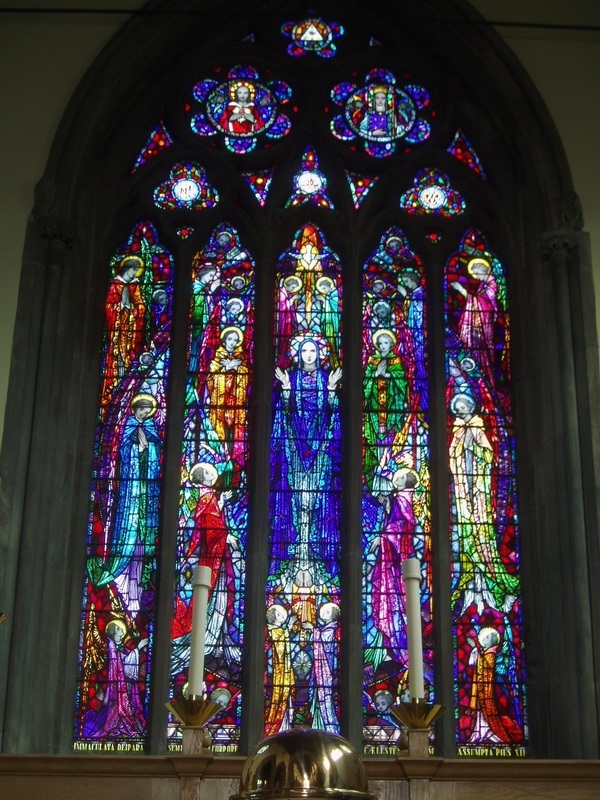 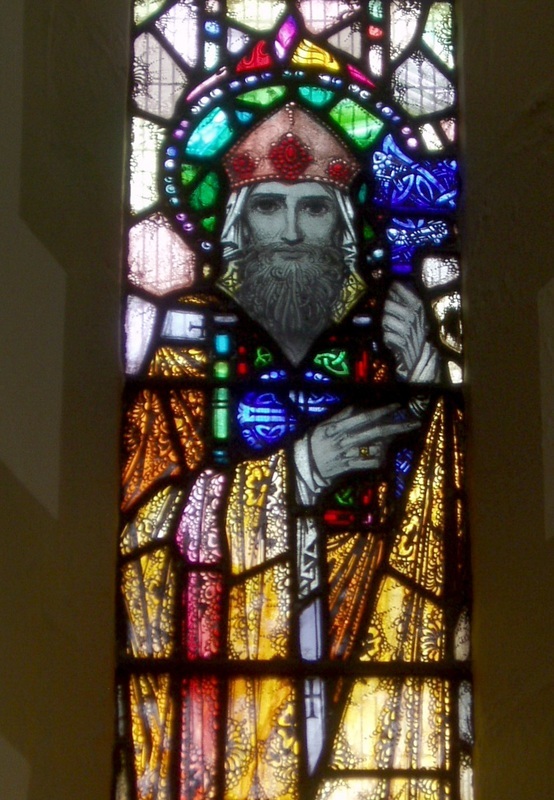 The rich stained glass throughout the church dates from the 1950s and is the work of Earley Studios of Dublin, betraying strong influence of the style of renowned Irish glass artist Harry Clarke (though post-dating his death by many years). 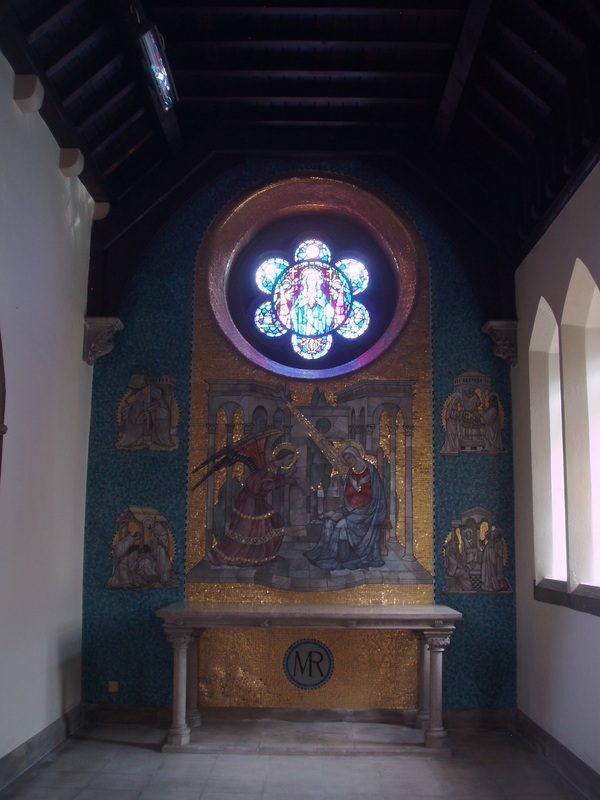 The end walls of both chapels (Our Lady and St Benedict's) flanking the sanctuary, where the war damage had been most severe, were remodelled and adorned with mosaics that act as a reredos in each case, with the main pictoral elements rendered in opus sectile. 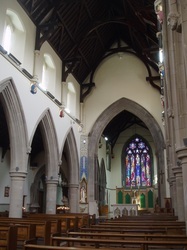 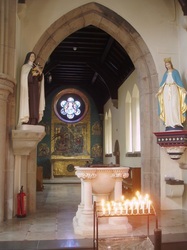 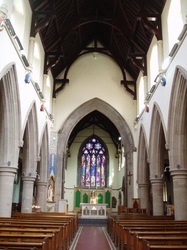 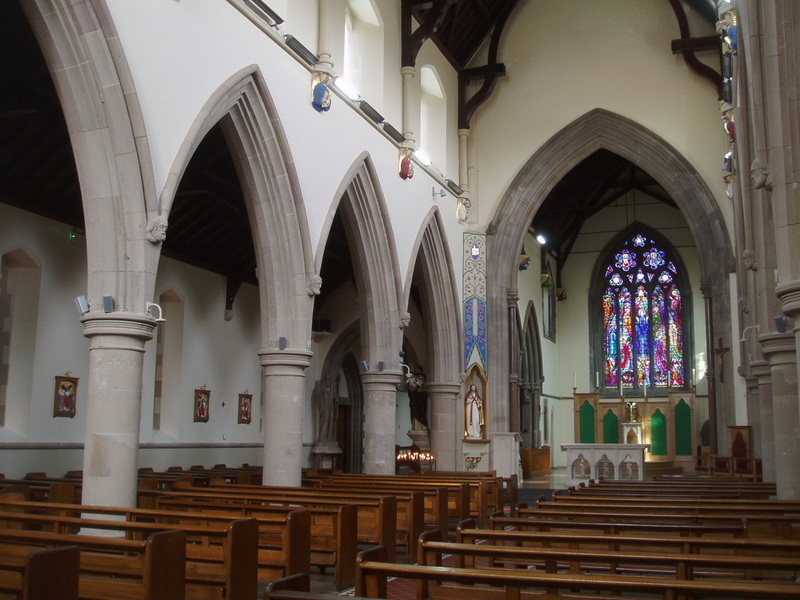 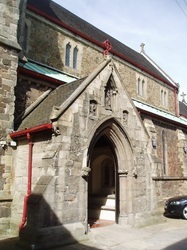 Some of the surviving Victorian decoration was lost however, a Hardman's mural over the chancel arch, showing Christ in Majesty flanked by attendant saints, was removed (or painted over) as were some stencilled accents around the statues and stations of the Cross (these latter elements were reinstated more recently). 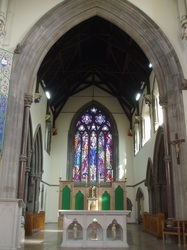 The redesigned altar now sits at the entrance to the chancel, with the remainder of the space being left open and a new reredos/screen placed further back. Within the structure of the altar are three glazed openings containing small alabaster statues, with Mary in the centre flanked by St Denis (holding his own head, in addition to the one on his shoulders!) 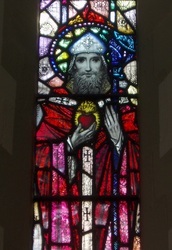 and St Lawrence (holding the gridiron of his martyrdom). 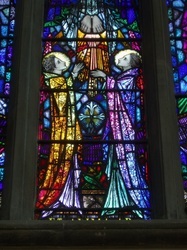 The two outer figures appear to be late medieval English work, whilst Mary looks later and possibly continental in origin. 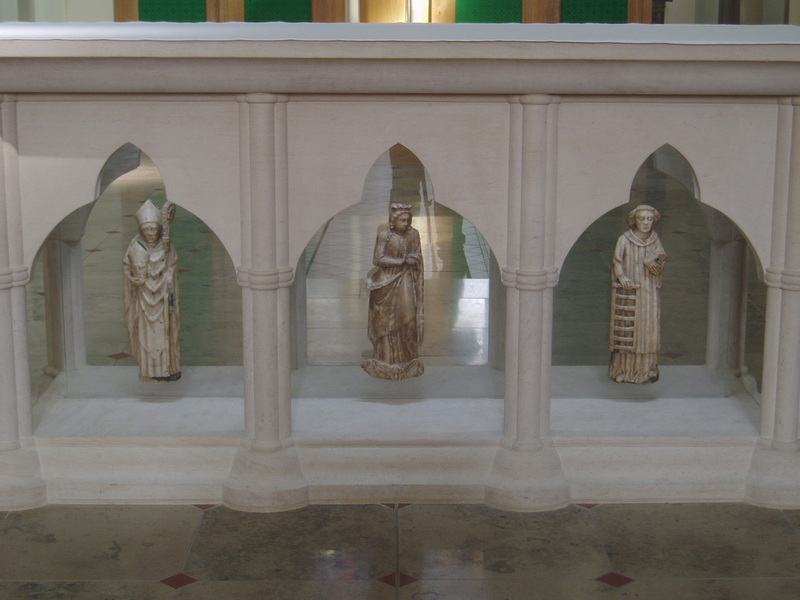 Thus far I have found no information regarding the provenance of these figures. 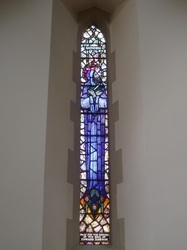 It is the stained glass however that gives the most pleasure here, with the rich five light east window making a most effective focal point for the interior. 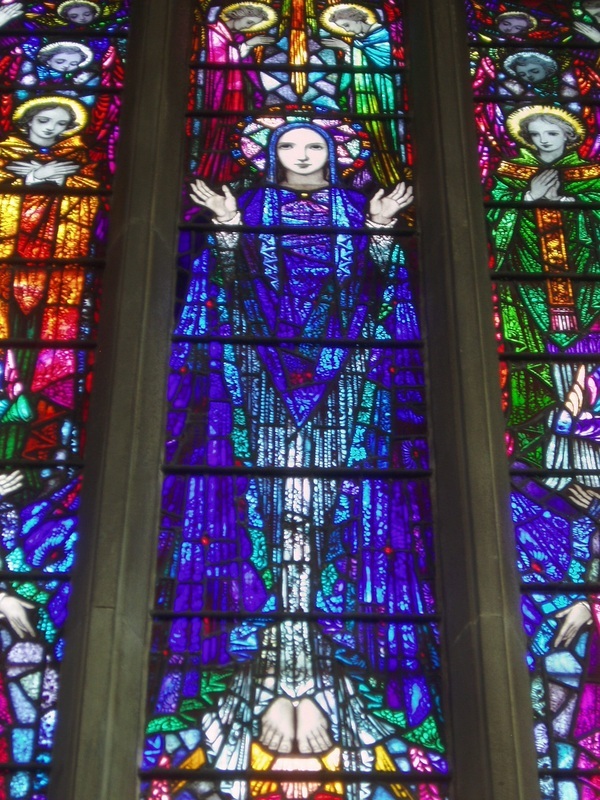 It's rich, glowing colours are a delight to behold, with a joyful figure of Mary surrounded by the Angelic Host, a real vision of Heaven. 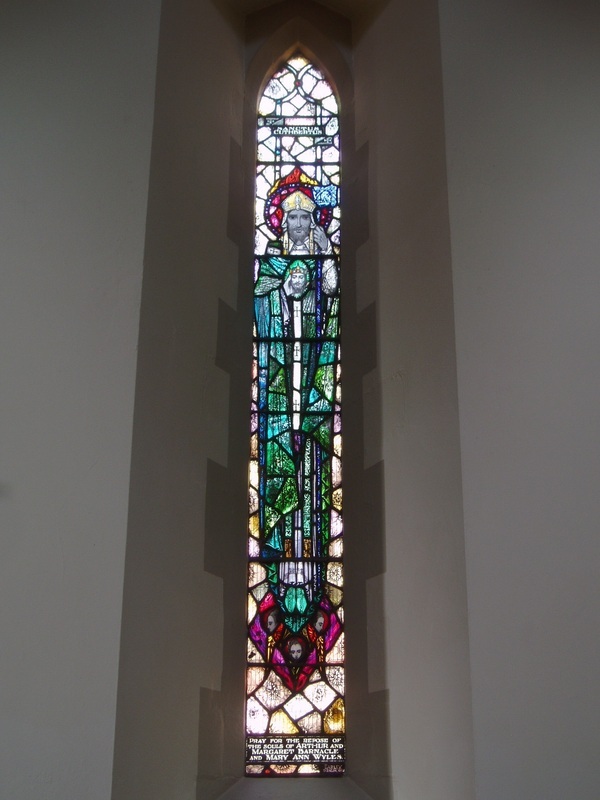 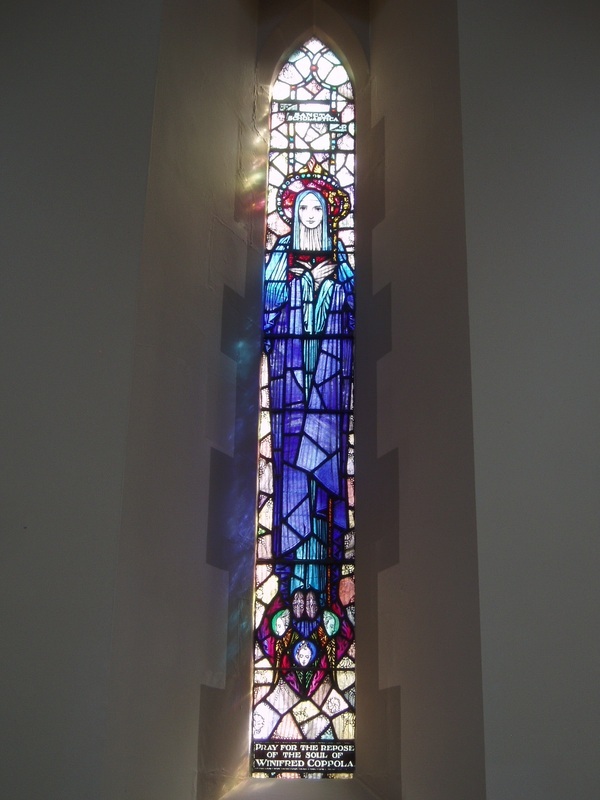 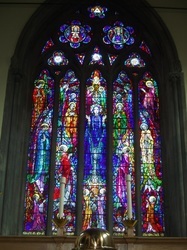 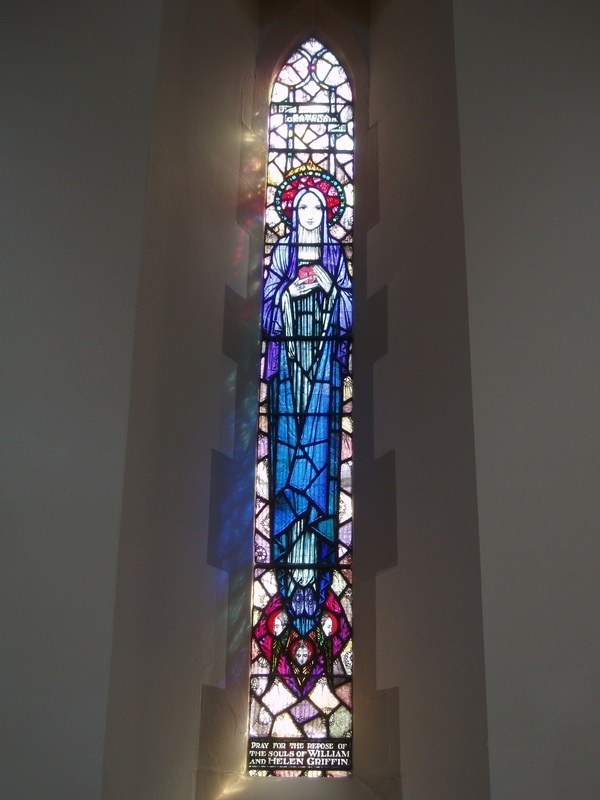 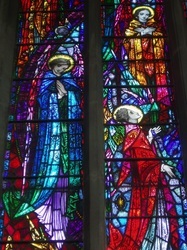 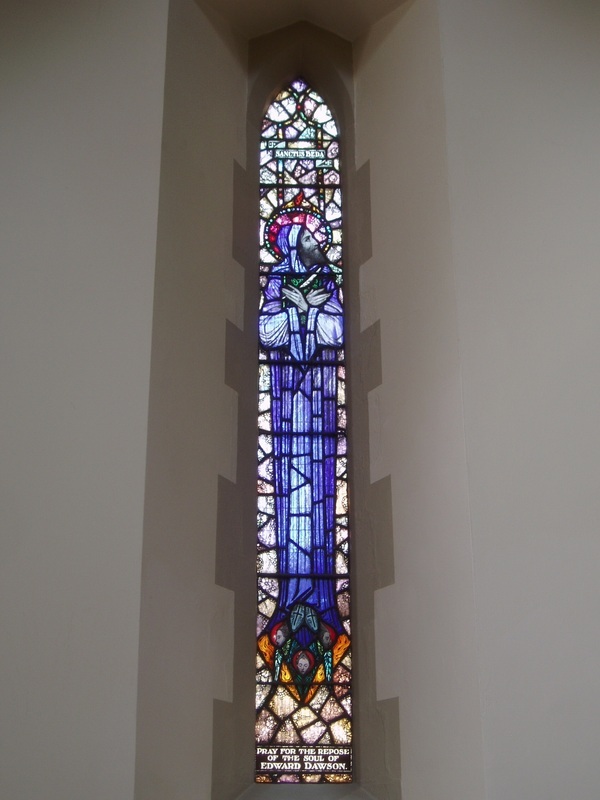 It was installed in 1950 and the first of the scheme of windows by the Earley Studio of Dublin. 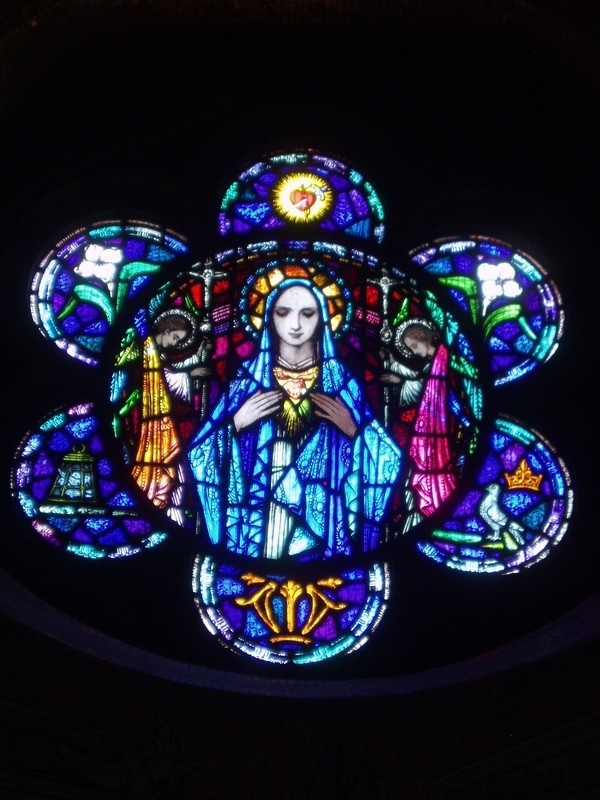 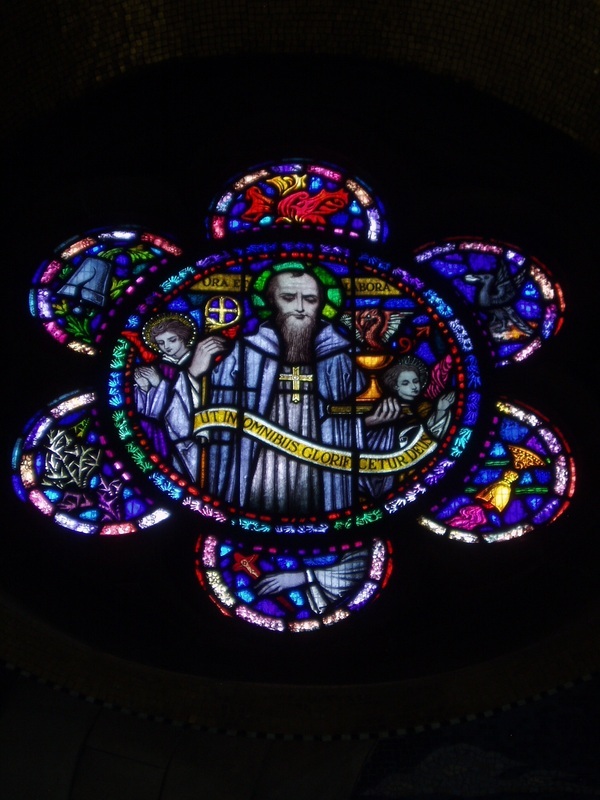 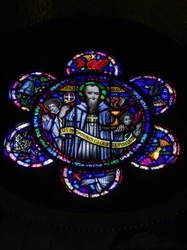 Two small rose windows in similarly flamboyant style were installed soon afterwards on either side in the chapels of Our lady and St Benedict, portraying each individual respectively. 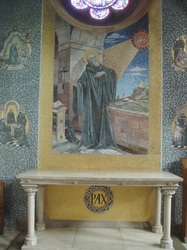 Below them are the opus sectile mosaic murals, that on the north side with a striking portrayal of St Benedict along with four smaller scenes from the Saint's life; it is balanced by that on the south representing a Fra Angelico inspired Annunciation, again with four smaller scenes of the infancy of Christ. 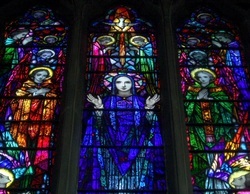 Like the windows they date from the early 1950s, though I am unsure who created them, possibly Hardman Studios? 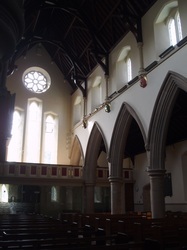 The nave aisles contain lancet windows portraying eight medieval saints, four males, mostly bishops, on the north side and four female, mostly abbesses, on the south, culminatiing in the church's patron, St Osburga. 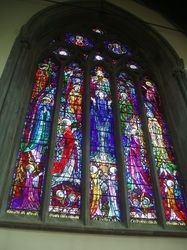 Again they are the work of the Earley Studio and date from 1952. 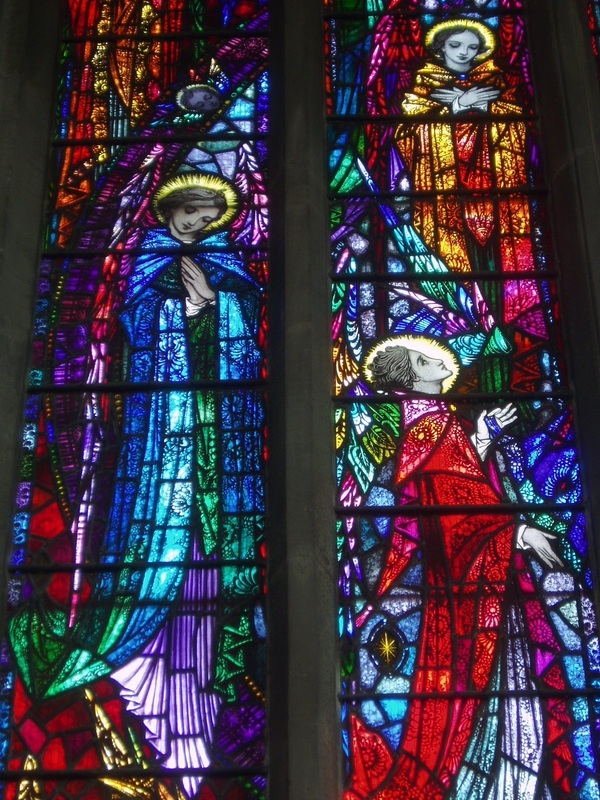 The influence of Harry Clarke's work in the colouring and detail is readily apparent. 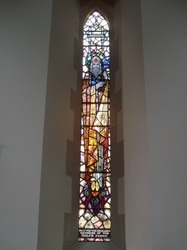 At the west end the area beneath the gallery has been partitioned off by a glazed screen, installed as part of the recent refurbishment to create a creche area. 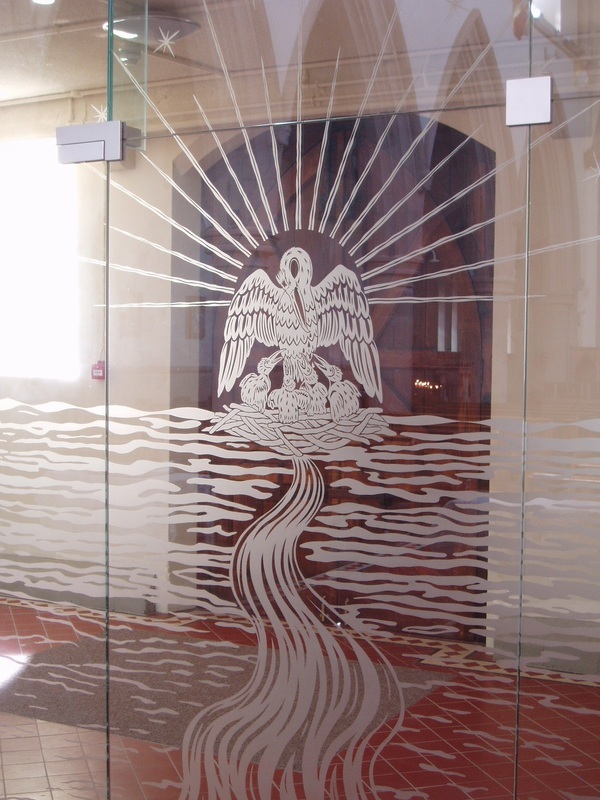 It is decorated with contemporary sandblast-etched designs spread across the width of the screen, with emblems of the Eucharist and a Pelican in Piety. 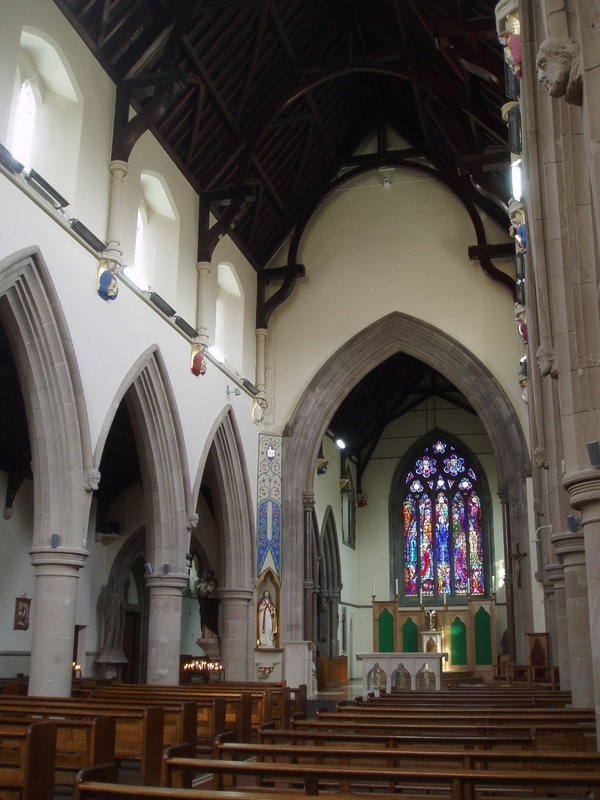 The modern restoration of the interior has breathed new life into this church and a healthy sign that this is a thriving parish, though doubtless the financial burden of the work will still be felt for some time to come. 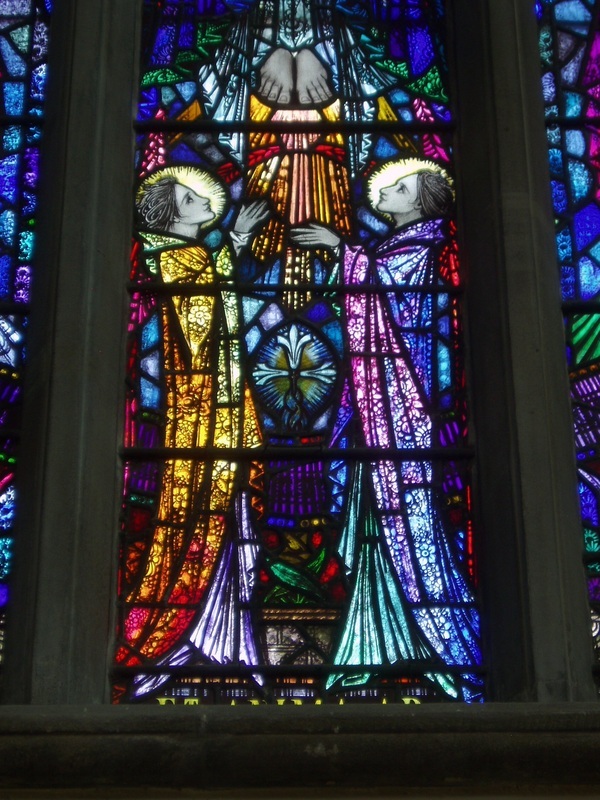 On the way out I noticed one final window in the porch, two lights depicting Christ and Mary, unrelated to the Earley glass within, and looking more like the work of Powell's of Whitefriars, though unsigned. 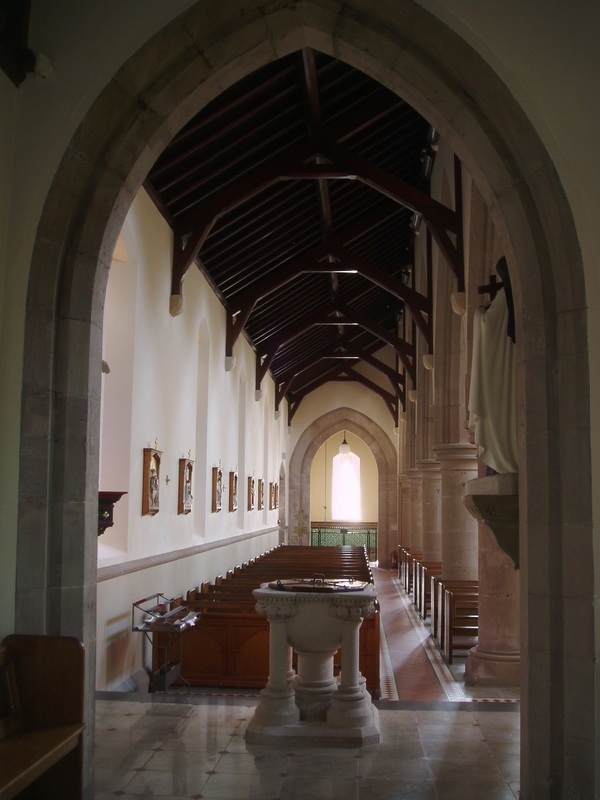 I found visiting St Osburg's a most pleasant experience, and a real surprise having neglected to visit it for so long. 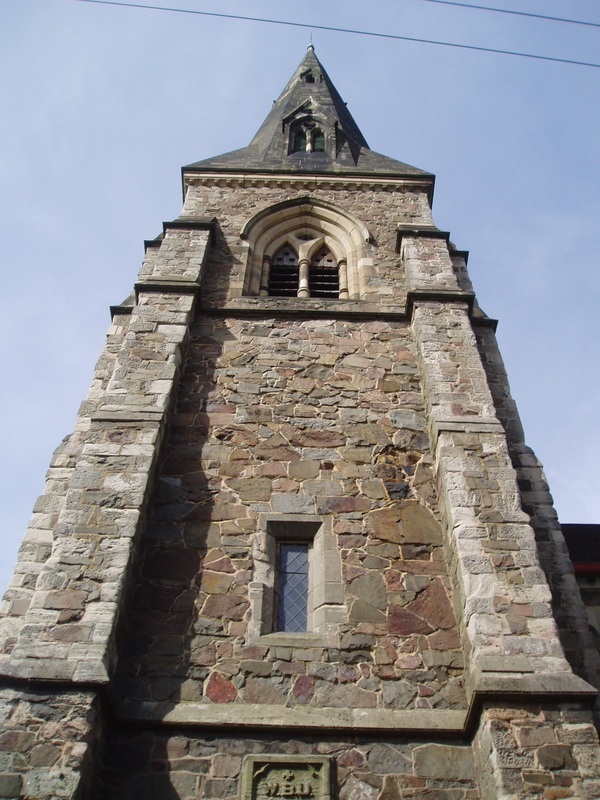 It is clearly a well loved church and rightly so. 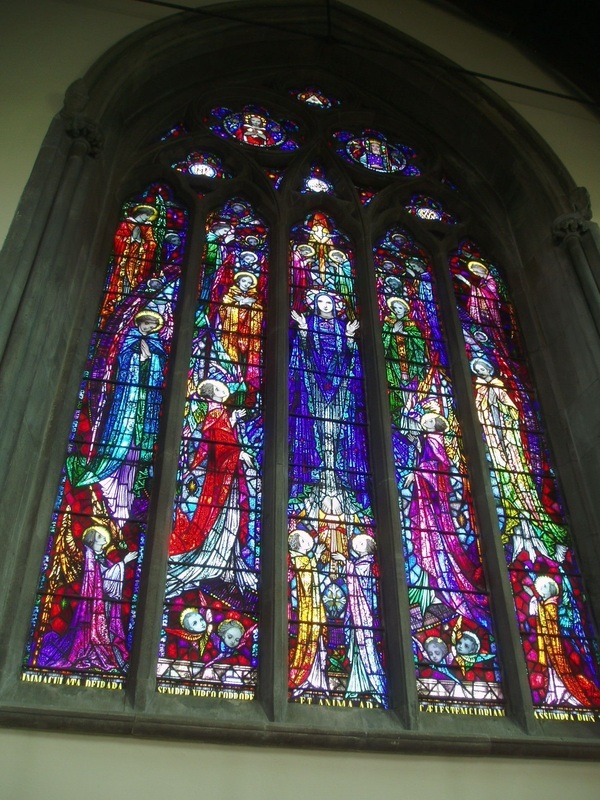 It has been beautifully reordered and has much to delight the eye, particularly the stunning series of windows which are worth making a long journey to see. Regarding opening hours I cannot say for sure what they might be, but I found it open and a haven of peace in such a bustling place, a stone's throw from the busy ring road that strangles the city centre.